All six league fixtures takes place at Monkton Stadium, Jarrow, on Monday evenings. Field events now start at 6.15 and track events at 6.30 so you need to arrive by 6pm prompt to register and choose your events for the night. Don’t forget to bring your yellow NEMAA membership card with you on your first visit as proof of paid-up membership. If you would like to take part but haven’t yet joined NEMAA there’s still time but you need to have done so before you go to Monkton (see Geoff H / Jayne H if you want any more info or an application form). Registration for each meeting costs £3 (pay on the night) and you can choose any 3 of the available events. You may combine track and field events but it’s always worth checking with the timetable before you make your choice – try to avoid events that are scheduled to take place at the same time (although finishing a 1500 metres race then going straight to the long jump whilst still in oxygen debt is all part of the “Monkton Experience”!) You will be issued with a number on your first visit – use this number each time you compete (like in the Harrier League X-Country). 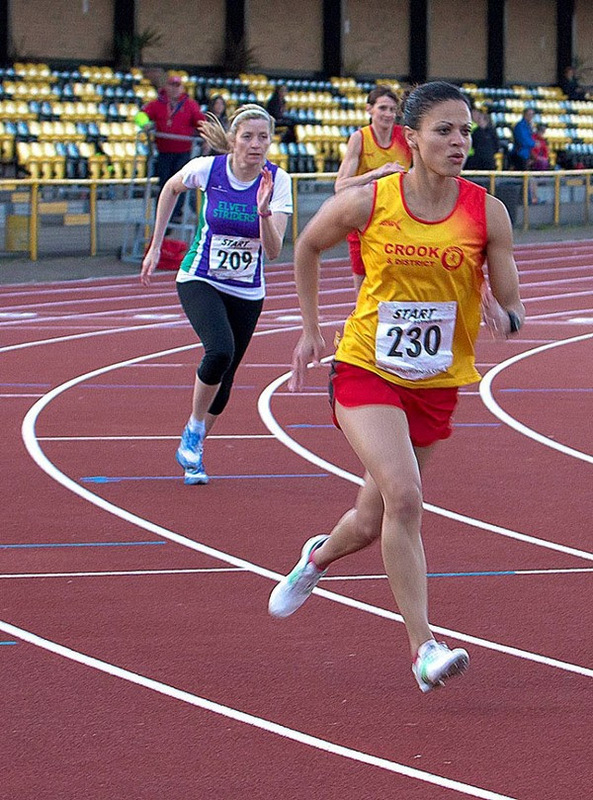 There are separate league competitions for men and ladies, as well as individual awards. In each age category the individual awards are available in four different event categories: sprints, distance, jumps and throws. Points are scored in 5 year age categories so you are always effectively competing against people in your own age range. 1. Athletes are responsible for assembling in the correct start area for their race in good time. Listen for announcements over the tannoy. 2. Order of running is usually oldest to youngest ladies then oldest to youngest men. 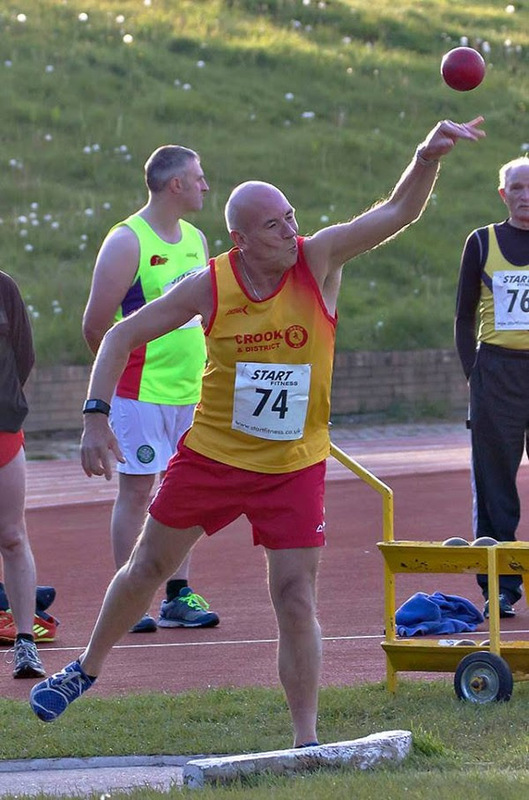 Age categories may occasionally be combined (especially in longer races) or the older men might run with the ladies in, say, a 3000 metres race, but your points are still based on where you finish in your own age category. 3. The Starter’s Assistant will call out the numbers (not names) before your race (like taking a register!). 4. Sprints (up to 400 metres). Lanes are always drawn for these races and you MUST stay in your lane for the entire race. You can choose whether to do a sprint start or a standing start. The Starter’s instructions will be “Take your marks” , “Set”, then go on the gun (a starting pistol is used). 5. 800 metre races may involve either a line start (where you can ‘break’ immediately) or a lane start (where you ‘break’ after 120 metres – there is a green line across the track at this point). ALL races above 800 metres begin with a line start. The Starter’s instructions for 800 metres and above will be “Take your marks” followed by the gun – there is no “Set” command. 6. At the end of your race make sure that you run right through the line, then turn around so that the timekeepers can see your number (don’t worry they will remind you if you forget!). You can, of course, record your own time and whilst this is fine in longer races (800 metres plus) I would not recommend fiddling with your watch at the start of a sprint. 7. Footwear – track spikes are recommended, particularly for the sprints otherwise you will be at a major disadvantage. For longer races, you can wear flat road racing shoes if you feel more comfortable in these. 1. These often overlap with track events so, as mentioned earlier, check the timetable of events and be prepared to adopt a flexible approach! Listen for announcements and keep an eye on the event area. 2. Before your event starts you will need to register with one of the officials: name, club, number and age category. 3. Every competitor is allowed THREE jumps / throws initially. Anyone who reaches the standard for that particular event has the option of three further attempts. Standards vary according to age category and are different for male and female athletes. 4. In order to score points you must register at least one VALID jump / throw. club. A comment often heard in the vicinity of field events is “I haven’t done this sinceI was at school!” Everyone is always very friendly and supportive. After you have been to two or three meetings you will have set yourself targets to aim for in the future. By this stage you should also have some idea of the standard of other athletes in your age-category, and this will help you to pace yourself more effectively in longer races. A bit of forward planning would be useful in age-categories where we have several representatives. Ideally we should try to avoid having more than two people from the same age-category in the same event. Only three athletes from the same club can score points in a given event in their age category. For example, if four of us entered the M55 200 metres and finished 1st, 2nd, 3rd, and 4th, the athlete in 4th place would not score any points. 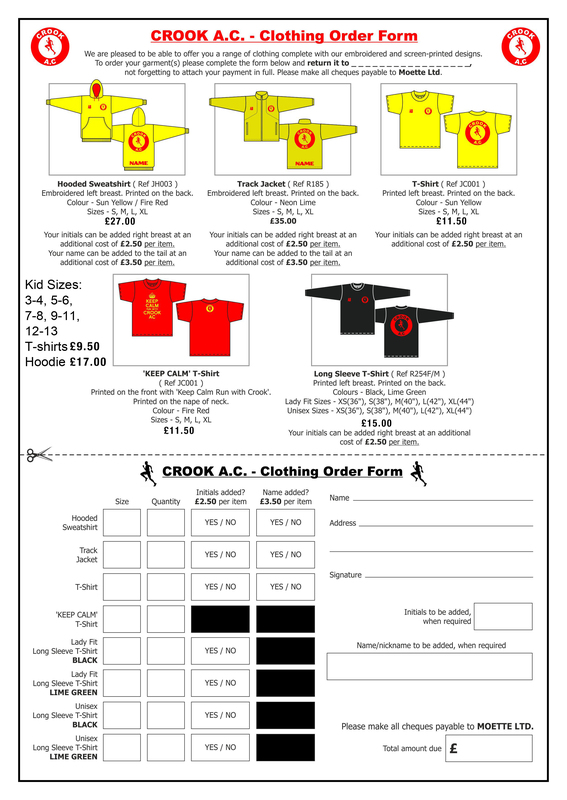 Let’s really go for it this summer, flood the track with yellow and red, and try to get Crook AC high up in both the Men’s and Ladies’ leagues!